Five new synthetic grass tennis courts have recently been completed at the Northern Suburbs Tennis Association – Naremburn. 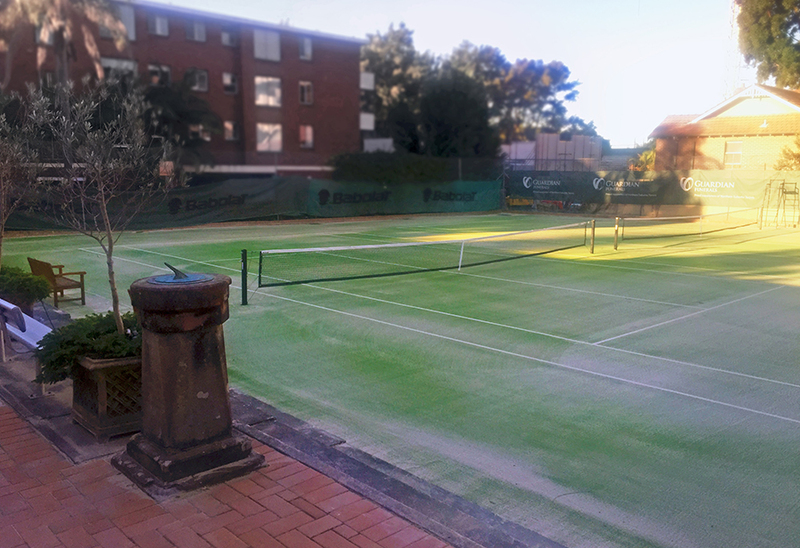 This has improved the overall appearance of the centre and is assisting in attracting new members to the tennis club. A major issue with the original courts was that tree roots were interfering with the court surface, making match play almost impossible. Sports surfacing contractor – Polytan, removed the existing surface and tree roots and installed a deep tree root barrier to prevent future damage to the tennis court. The kiln dried sand infill was sourced from Williamstown and layered with the synthetic grass surface. Grand Slam Sports Equipment supplied 5 new external winding tennis posts, tennis nets and sleeves to replace the old ones. These were manufactured in Brisbane using galvanised steel and powder-coated for extra protection. For further information about sports equipment for clubs, schools, councils and homes, please contact Grand Slam on 1800 773 461.